At Minnewaukan Public School there is a group that will help those who are thinking about suicide. This group is the Suicide Prevention Team and they welcome anyone above 7th grade to join. There is a student president on the team that has been there awhile. The team discusses the causes of suicide and how to get help for you and others. They talk about activities and what kind of posters to make for the hallways. The team puts motivational quotes on the high school side. The activities that were completed last year were pickle sales, sweatshirt sales, Halloween dress up contest, and radio ads were made by students and put on KDLR. 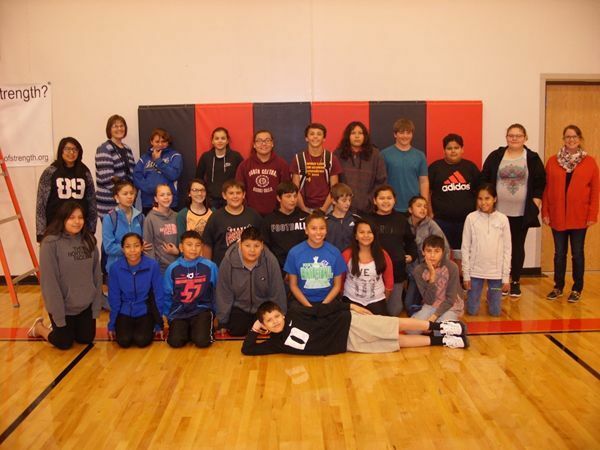 The team also completed two hours of prevention training, shared our efforts with the Elders group from Spirit Lake Tribe, held the Parker Mudget Memorial Basketball Tournament, hosted a cookout, participated in a Knocker ball game and went to Norther Air in Grand Forks. The Suicide Prevention Team is helpful to those who need to help and those who want to help someone. Dangerous or self-harmful behavior: Potentially dangerous behavior, such as reckless driving, and increased use of drugs and/or alcohol might indicate that the person no longer values his or her life. Threatening suicide: From 50% to 75% of those considering suicide will give someone -- a friend or relative -- a warning sign. However, not everyone who is considering suicide will say so, and not everyone who threatens suicide will follow through with it. Every threat of suicide should be taken seriously.If you recognize any of these symptoms, act fast to try to get to the bottom of why this is happening. If you know the person, talk to them about why they are behaving this way and let them know that you care; just having someone that the person can talk to about their problems can alleviate some of the tension and stress pent up inside them. Every situation is dynamic however so if this does not work, then another option is to seek help by calling 911 or 211 for assistance on the manner while keeping a close eye on the person.